The Netherlands - Phantom 20 LED Beam Razor-sharp beam effects have become the standard on all leading stages. Showtec from Highlite offers a wide range of beam moving heads, which was recently expanded with the highly affordable Phantom 20 LED beam. In this case, a start-up model means a lot of capacity for relatively little money. The Phantom 20 LED Beam is equipped with a 20W white LED. It may not seem like much, but due to its narrow angle (only 5°), all the power is compressed into one small surface. The LED is cooled effectively by a low-noise fan, which is also a plus point in terms of durability. The light escapes from the moving head through a specially designed lens. The focal point of the beam can be determined by turning the ring around the lens. The beam angle will always remain five degrees and, as a result, the beam projected into the hall will always be razor-sharp. The effects that can be reached with this are unprecedented, particularly if multiple Phantom 20 LED Beams are used. 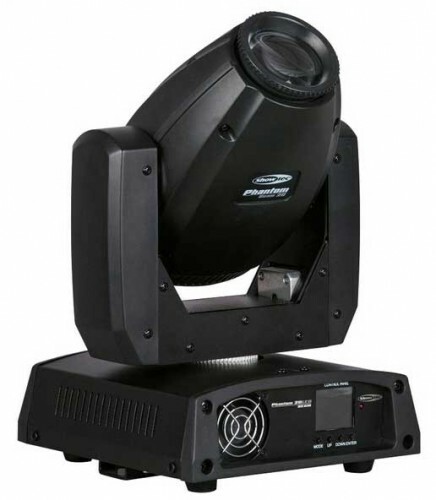 The moving head's compact form and light weight enable it to move with lightning speed. Chases with rapid movements are no problem at all for these heads. The 16-bit controls make it possible to aim the bundle with the greatest accuracy. The settings are easy to adjust through the multi-colour display. There is no need to bother with dip switches or simple displays; you now have a clear overview of the settings that can be changed at your fingertips. Extensive functions, such as a maximum beam angle within which the head can move freely, are simple to set.